As far as photography skills go, Jacob has some pretty amazing genes. My grandfather was a Navy photographer back at the end of WWII, before it was an official rating. When he got out of the Navy, he worked for several different television companies. He even did the closed-circuit video for the Miss America Pageants. I always joked that if my grandfather could have a camera surgically implanted in his eyes, he would! Jake’s dad is also a photographer. He spent 6 years as a Navy journalist, then years as a news photographer (mostly video). He also worked at the proving grounds, photographing things blowing up. Genetically, he’s got major advantages over me when it comes to photography. 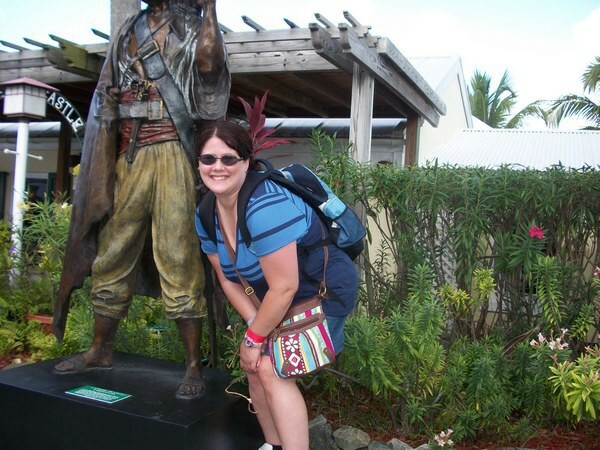 He took that picture of me in St. Thomas when he was just 5. I got my grandfather’s vision and imagination, but not his technical skills for photography. I think Jacob could have both. Lately, Jake’s been expressing a major interest in shooting video and taking pictures. When the chance to check out and review National Geographic Kids Guide to Photography popped up, I thought it would be fun. I secretly also thought that if the book was written for kids, I’d actually understand it too. I have at least 30 books on photography on my Kindle and I don’t understand a word in any of them at this point! 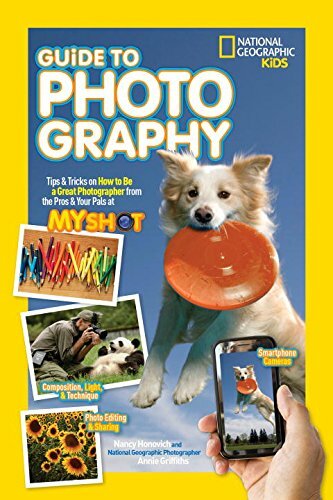 Kids Guide to Photography is a great way to introduce your children to every type of photography, from simple point and shoot camera to cell phones to video camera. It’s visually engaging, something that many grown-up photography books lack in my opinion. If you want to tell someone how to take good pictures, it really helps to actually SHOW good pictures! The book starts with a breakdown of the camera’s parts. Every camera has the same basic components and understanding what these parts do is the first step to taking great pictures. From there, your kids can learn more about the cameras they have access to, be it your cell phone camera or a fancy DSLR. As the book goes on, kids will learn everything from choosing a subject to making sure the lighting is just right. They’ll get expert tips on how to take the picture and help for when it goes wrong. Most importantly, it does all this in a language that middle-grade kids can understand AND it makes it fun. After reading a section, your kids can try out their skills with different challenges called “Annie’s Assignments,” taking the lessons out into the real world. 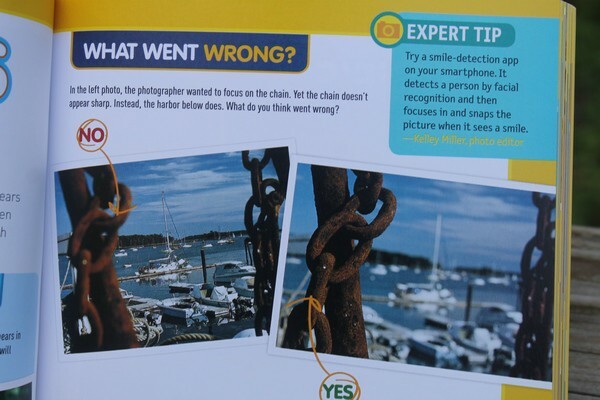 National Geographic Kids Guide to Photography isn’t just a great way to teach kids how to take amazing pictures, it’s also a fantastic resource for YOU. Like I said, it’s easier to read than a lot of the advanced photography books out there. It gives you a good place to start before you delve into deeper books. I recommend getting a copy, then practicing your own skills along with your kids. Think of the adventures! Get your copy at National Geographic or on Amazon. Do your kids love taking pictures? What kind of camera do they use? This is a nice thing for Nat Geo to do. It will encourage kids to take pics and who knows, they might just make a career out of it when they’re older. This is cool. I can’t take a really great picture to save my life–oh I know what needs a picture taken of it–and I do have an eye for art and color arrangement–but a camera–it doesn’t help that I absolutely hate pictures being taken of me and I will hide when a camera is in my vicinity being held by a person with that “I’m going to get a picture of her” in their eye. How awesome! My oldest LOVES taking photos and hes really good at it too. I think it’s awesome to get kids into photography, and who knows where it could take them! Alyssa and Abby have both surprised me with their love of taking photos so I’m sure this would be something I’d consider purchasing. I fell in love with photography myself when the kids were born so we could enjoy it as a family. My granddaughters will love this. Lately, they are into taking photos. This book will be very helpful. I’m always looking for tips on how to improve my photographs. I will have to check out that issue of National Geographic Kids. Kids love to take pictures too. I have four of them (kids, lol) and they’ve all loved it (still do and some of them are grown 😉 ). I would love to get this for the kids. They have been having an interest in things like this more and ore. I love this! My kids have been fascinated by photography since they were old enough to realize what it was. It’s great to hand then a camera and let them go then look at all the photos from their perspective.